Artcurial Motorcars completed its three-day Retromobile auction in Paris on Sunday, reporting total sales of $47,804,169, a 31 percent boost compared with the 2018 sale. 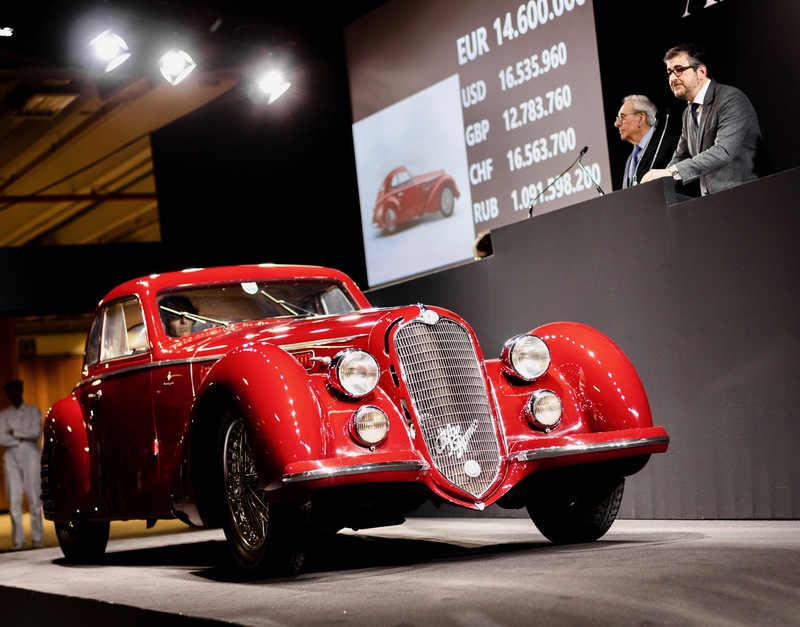 The Paris-based auction company noted that 10 vehicles sold for record prices. 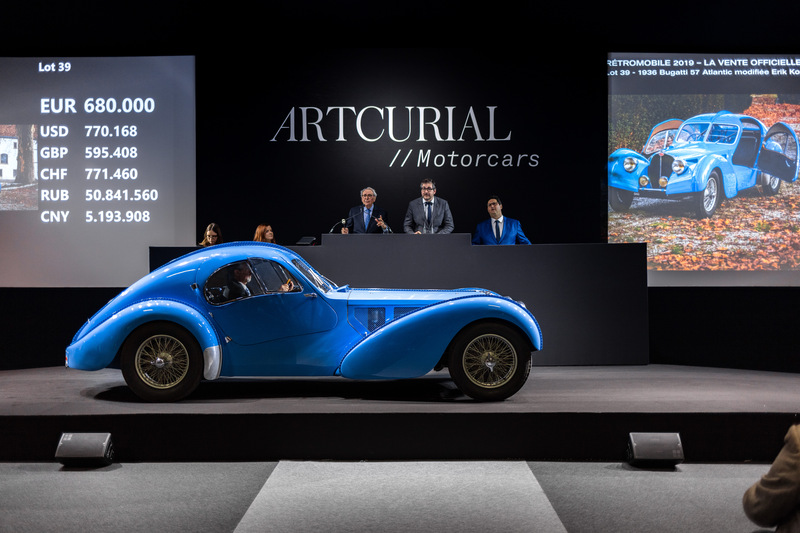 The overall sell-through rate was 76 percent, and Artcurial reported that 84 percent of vehicles sold went to buyers from outside of France. 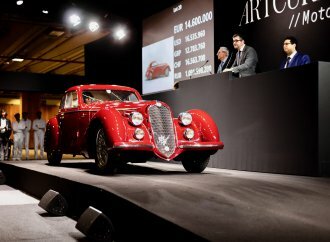 American collectors made four of the six most expensive purchases at the sale, including the top two vehicles, the 1939 Alfa Romeo 8C 2900 B Touring Berlinetta that sold for more than $18.9 million, the third-highest amount ever paid at auction for a pre-war vehicle, and the 1966 Serenissima Spyder that brought an auction-record price of more than $4.7 million. The ’39 Alfa Romeo 8C 2900 had been owned by the same Dutch family for 43 years. 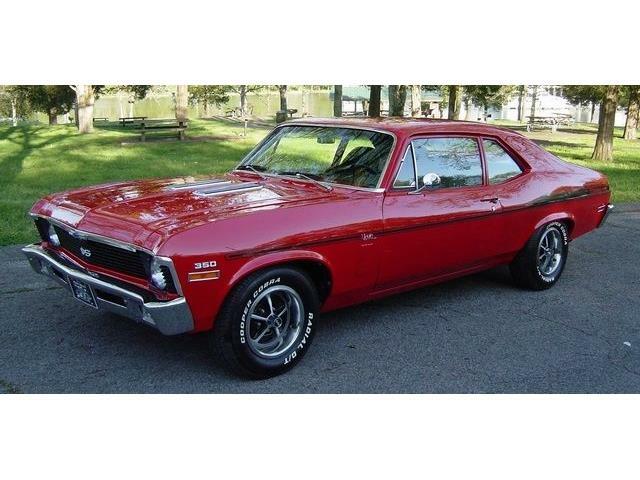 The car had been purchased by the consignor’s father for less than $12,000. The ’66 Serenissima Spyder was one of three Serenissima cars consigned to the sale by Count Volpi di Misurata, who in 1965 established the brand and its racing team. Only two Spyders were produced and only one of them survives. It also is the only Serenissima to have raced at Le Mans, driven in the 24-hour competition in 1966 by Jean-Claude Sauer and Jean de Mortemart. 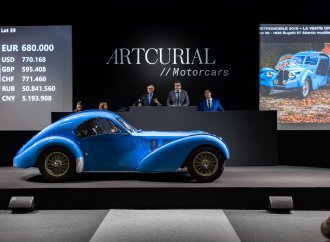 Artcurial Motorcars reported that several collectors — both in the room and on the telephones — were competing for the car, which had a pre-sale estimated value of less than $2 million. 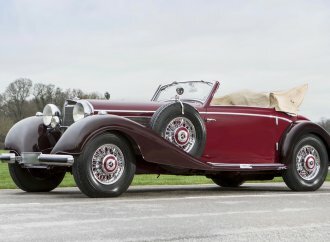 The auction also featured a quartet of pre-war cars discovered in a barn in Belgium. 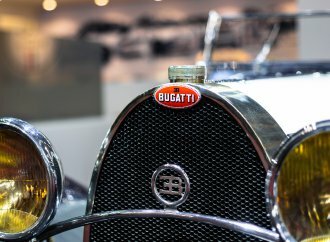 Among them, a 1937 Bugatti Type 57 Cabriolet by Graber brought $565,678, a 1932 Bugatti Type 49 Vanvooren sold for $222,300, a 1929 Bugatti Type 40 sold for $215,500, and a 1925 Citroen 5HP went for $24,300. 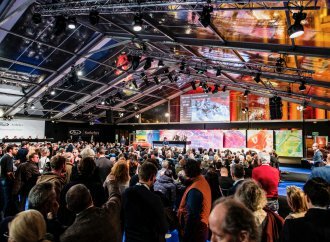 After the primary collector car sale on February 8, auction action on February 9 focused on a collection of nearly 90 MV Agusta motorcycles collected in the past half century by a family of enthusiasts in Italy. 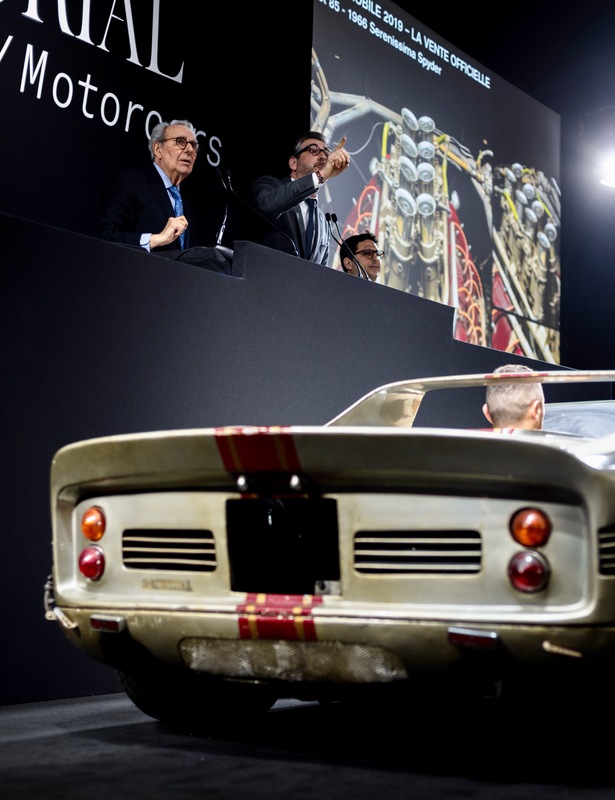 The first of the MV Agusta bikes offered up for bidding was ridden onto the auction block by Giacomo Agostini, the 15-time world championship rider who made his name racing for MB Agusta. After it sold, he signed the 2017 MV Agusta F4 1000 that sold for $47,600. The highest price paid for a motorcycle at the sale was $108,800 for the ex-Arturo Merzario 1972 MV Agusta 750 S.
The three-day auction concluded February 10 under the theme of “Racing, Flying & Yachting.” Among the consignments crossing the block was a full-scale Renault single-seater racing car built from Lego blocks; it sold for $107,700 with proceeds donated to Unicef. A racing suit previously worn by Ayron Senna sold for $110,200 and a helmet worn by Alain Prost brought $61,700.